Last season, Olympic ascended to No. 1 in the Observer's Sweet 16 for the first time in school history. Friday night, Olympic may've hit another milestone, grabbing the biggest win in school history. Some historians may argue, but I'd peg Olympic's 71-68 win over West Charlotte in the championship game of the Upward Classic as the biggest in school history. And it may be the first of two meetings between the teams this year. For years, West Charlotte, No. 3 in the current Sweet 16 poll, has been the king of Mecklenburg County public school basketball, and in some respects all of Mecklenburg County ball. The Lions have won five state championships since 1986 and are the current reigning champions. They have long been the measuring stick for county teams. Olympic, currently No. 1 in the Sweet 16, has not won games like this often, most famously being blown out 12 years ago at the old Charlotte Coliseum by West Charlotte in probably the Trojans' biggest game before this, with 15 college coaches, including former Georgetown coach John Thompson (the father of the current coach) in attendance. This time, the Trojans did it in front of a huge crowd in Spartanburg, S.C., and in front of regional recruiting people and college scouts. It's the kind of win that will make the Trojans the favorite to win the N.C. 4A championship and the kind of win that will make people look forward to a potential rematch in the N.C. 4A regionals. The teams were in line to play in the regional championship last March before Olympic was upset in the regional semifinals. It'll be interesting to see what happens if the pairings open up to allow it to happen again this year. Ever since the Hardwood Classic pairings came out a few weeks back, Kennedy Charter boys basketball coach Ed Addie said people have been asking him about a potential meeting with Northside Christian in the semifinals. It'll happen in tonight's 6:50 Hardwood Classic semifinal at Bojangles' Coliseum and it will be the Mecklenburg County game of the year so far. "That's the game," Addie said after an easy first round win over Queens Grant Tuesday. "Carolina Preps has them No. 1 in the state and us No. 10. There's a little bit of a gap there and I think my boys have a little bit of a chip on their shoulders. We don't want to come out too crazy, but stay calm and consistent. Northside has a great coach and a great team. We look forward to playing them. It's going to be a good game." Northside (10-0), No. 2 in the Observer's Sweet 16, has beaten two teams ranked in the S.C. top 10 polls as well as a High Point Wesleyan team that has been ranked nationally. As Addie said, Northside is ranked No. 1 in the Carolina Preps poll of N.C. Independent School teams, ahead of such traditional powers as Arden Christ School and Charlotte Christian, and the Knights are looking for their second straight state championship berth in February. Kennedy Charter (12-0), No. 10 in the state independent poll, is new to this state power thing, but the Eagles are one of the most talented teams in North Carolina with at least seven guys who could play Division I one day. Both teams have great coaches and great systems. Northside averages 82.9 points, third-best in the Observer's 127-school coverage area, and allows just 47.6 points per game, eighth best. Kennedy Charter leads the area in scoring at 98.7 points per game and gives up a pretty stingy 52.4 points per game. Something's got to give tonight. "We'll see what happens," Northside coach Byron Dinkins said. "Based on our performance (in Tuesday'a spotty first round win over Gastonia Forestview), they're the favorites. But it always comes down to defense for us. If we can some things going offensively to go with it, we'll be OK."
San Antonio, Texas (November 30, 2011) – The U.S. Army All-American Bowl Selection Committee has narrowed down its list of nominees to six finalists for the prestigious 2012 U.S. Army Player of the Year Award, including: wide receiver Stefon Diggs (Our Lady of Good Counsel High School, Olney, Md. ); wide receiver Dorial Green-Beckham (Hillcrest High School, Springfield, Mo. ); defensive back Tracy Howard (Miramar High School, Miramar, Fla.); offensive lineman D.J. Humphries (Mallard Creek High School, Charlotte, N.C.); defensive back Shaq Thompson (Grant High School, Sacramento, Calif.); and defensive back T.J. Yeldon (Daphne High School, Daphne, Ala.). The U.S. Army Player of the Year Award is given to the Nation’s most outstanding senior in high school football participating in the U.S. Army All-American Bowl. The U.S. Army Player of the Year will be crowned during the U.S. Army Awards Dinner on Friday, January 6, 2012, in San Antonio. The winner will be presented with the Ken Hall Trophy, modeled after Ken “Sugar Land Express” Hall, high school football’s all-time leading rusher. As both a running back and a wide receiver in high school, Stefon Diggs can make big plays from several positions. He has good size and strength, which allows him to take advantage of smaller defenders and shield defenders from the ball. He can stretch the field with his quickness, and his cutting and vision skills make him tough to bring down. He has good hands and is able to adjust to inaccurate passes. Diggs finished the 2011 season with 1,443 all-purpose yards and 13 touchdowns while adding 32 tackles and four interceptions on defense. He is undecided on his college choice. Dorial Green-Beckham is an accomplished wide receiver who has great size and athleticism. He set the national career receiving yards record with 6,447 and finished the season with 119 catches for 2,234 yards and 24 touchdowns. Both Rivals.com and MaxPreps list him as the top overall recruit. He is strong and can use his size to fight off defenders and to shield the defender from the ball. He has excellent speed and is a deep threat. He has big hands that allow him to catch the ball away from his body or snag the ball out of the air or over his head. Green-Beckham is a red zone threat as a big target who can win jump balls. He has not made a college decision. Tracy Howard has a complete array of skills for a shutdown defensive back. He enters this weekend’s playoff game with six interceptions on the season, one returned for a touchdown. Howard has the size and speed needed to battle receivers at the line and to stay with them while running downfield. He plays with a physical style and likes to jam receivers at the line. Howard shows great recovery speed and footwork, which allows him to turn and run with wide outs. He reads offenses well and gets good jumps to close down space. Howard shows he can tackle on the edges and he can make plays in the open field. Howard has not decided on which college to attend. Possessing outstanding athletic ability, D.J. Humphries is one of the top offensive linemen in this class, ranking third among all recruits on the Rivals.com Top 250 and leading his team to a 47-points-per-game average. He has excellent feet and balance and moves extremely well for an offensive lineman. This ability allows him to block in space and find defenders at the second level, but also guard the edge against speed-rushers. He knows how to use his long arms and hands well in pass protection and engage oncoming defenders. Humphries knows how to finish his blocks. Once he adds more bulk to his lean frame, his ceiling is extremely high. Humphries has committed to the University of Florida. Thompson is a tall, physical defensive back who possesses great athleticism and football instincts. 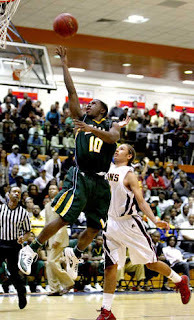 He is the top-ranked player in California according Rivals.com and MaxPreps. He has the ability to make plays all over the field, utilizing his excellent speed and closing angles. He is a solid tackler who can deliver the big hit, but also can use his balance and footwork to cover in man-to-man. Thompson is a playmaker with the ball in his hands, as evidenced by his almost 3,000 combined yards from the running back position over his final two seasons. He remains undecided on his college choice. T.J. Yeldon is an instinctive runner with excellent speed and acceleration. He has a great initial burst, which allows him to hit small windows and attack the defense. He had a huge senior season, compiling 2,193 yards rushing and 32 touchdowns. Yeldon’s balance and vision allow him to set up tacklers and break tackles. He has big-play potential, particularly using his receiving skills to create mismatches. As he adds weight to his frame, his ability to run between the tackles should improve and he will be able to add more of a power aspect to his game. Yeldon has committed to Auburn University. The selection process began this fall as players were evaluated by the U.S. Army All-American Bowl Selection Committee and by coaches from across the country. Past U.S. Army Player of the Year Award winners include: 2001 - Kevin Jones; 2002 - Lorenzo Booker; 2003 - Chris Leak; 2004 - Adrian Peterson; 2005 - Ryan Perrilloux; 2006 - Mitch Mustain; 2007 - Jimmy Clausen; 2008 - Terrelle Pryor; 2009 - Bryce Brown; 2010 - Dillon Baxter; and 2011 – Demetrius Hart. The first Hardwood Classic Christmas Tournament could be special. The game takes over the date and site at Bojangles' Coliseum where the old Bojangles' Shootout had been held in recent years. The tournament runs Dec. 27-29. The Charlotte Sports Commission, which is putting on the tournament, is also trying to breathe new life into the event by putting together the strongest field in three years, at least on the boys side. The boys tournament should be fun to watch with Sweet 16 No. 2 Northside Christian and No. 6 Mooresville in the field along with private school power Davidson Day and new area power Kennedy Charter Public School. In fact, all four of those teams could meet in the semifinals, including a Northside-Kennedy Charter meeting that could stand as the biggest Mecklenburg County game of the year so far. Both teams are unbeaten, stocked with a plethora of college recruits and two of the area's top coaches in Northside Christian's Byron Dinkins and Kennedy Charter's Ed Addie. One small change I hope organizers will consider for this or future events. In recent years, having back-to-back girls games in the 3:30 p.m. and 5:10 p.m. time slots has caused the event to lose momentum. I'd move the two girls games back one timeslot each day to avoid this. 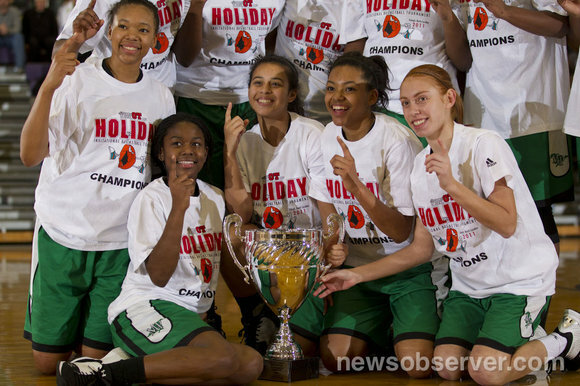 Other than that, I think the Mecklenburg County Christmas tournament is back. Tickets to the Hardwood Classic are $12 for adults and $6 for children and students under 18 with valid ID. Children under 3 get in free. Parking is also included in the ticket price. Day One Schedule, Dec. 27: Queens Grant girls vs. Hickory Ridge, 9 a.m.; Queens Grant vs. Kennedy Charter, 10:40 a.m.; Anson Senior girls vs. Berry, 12:10 p.m.; Northside Christian vs. Forestview, 1:50 p.m.; Covenant Day girls vs. Ardrey Kell, 5:10 p.m.; Mooresville vs. Ardrey Kell, 6:50 p.m.; First Assembly vs. Davidson Day, 8:30 p.m. The North Carolina High School Athletic Association released a new proposal for realigning schools into conferences Friday. The first was done by a computer. This one was done by staff. Below are proposed Charlotte conferences. Last year, Olympic ascended to the top of the Observer’s Sweet 16 boys basketball poll for the first time ever. It didn’t take the Trojans long to get back. After Harding’s big upset of preseason No. 1 West Charlotte Friday, the Trojans jump up a spot to No. 1. Olympic is 4-0 and plays Hunter Huss at home Tuesday night in a non-conference game. Huss (1-0) is reigning N.C. 3A state champions. Olympic lost in the N.C. 4A quarterfinals last season. The Trojans’ Allerik Freeman, a junior, leads the team at 17.2 points per game. He’s ranked No. 9 nationally in his class by ESPN. Freeman and the Trojans are winning by an average of 14 points against a pretty touch schedule. -- Two new teams joined the boys poll: No. 10 North Meck, off to a 4-0 start, and Harding, which sprung the West Charlotte upset and has only lost to nationally ranked Milton, Ga.
-- In the girls poll, unbeaten Freedom jumped in at No. 11 and Myers Park and Ardrey Kell -- two Southwestern 4A foes -- moved up to the No. 3 and 4 spots. Those teams meet Dec. 16 at Ardrey Kell and Jan. 27 at Myers Park. Note: Davidson Day, which was ranked No. 7 in the preseason poll, will not be eligible for inclusion for the remainder of the season. While the school has adopted the “eight semester” rule, which would not allow students who have repeated a year after starting ninth grade to maintain eligibility, the school still has some players on its teams who have repeated a grade and are playing. Davidson Day officials say that these players will graduate next spring and after that time, the school will be Sweet 16 eligible. Note: To be ranked in the Observer’s Sweet 16, a team must be in the Observer’s coverage area, field football and basketball teams and not allow a student-athlete to re-class after ninth grade. For a detailed look inside the poll, including the criteria used to compile it, visit? When Harding lost 74-58 to nationally ranked Milton (GA) at the Charlotte Hoops Challenge last month, Rams coach Walter Aikens was proud of his team. He loved how tough his kids played and knew if they could repeat that kind of performance against N.C. competition, even elite N.C. competition like West Charlotte, the Rams would be a tough out. Sure enough, on the same night West Charlotte celebrated winning the 2010 N.C. 4A state championship, that toughness showed in a 66-65 upset that is one of the biggest in Mecklenburg County in years. West Charlotte is nationally ranked in many polls and sits at No. 1 in the Sweet 16. Harding (4-1) ended the Lions’ 15-game win streak. West Charlotte is 1-1. Jarvis Haywood hit two free throws with 1.1 seconds to win the game. He finished with 29 points. Harding led by 10 in the first half and fell behind by 10 in the second half. Aikens said it was Harding’s first win over West Charlotte since 2009. Olympic High's boys basketball team, ranked No. 2 in the Observer's Sweet 16, will play the remainder of the season without of one its best players. B.J. Gladden, a 6-foot-5 junior wing, has been declared ineligible. Sources told the Observer the issue was with his residency. Sources say Gladden was not living in Olympic's district. Sue Doran, director of athletics for Mecklenburg County schools, said Olympic will not be held accountable for the eligibility issue. While not naming Gladden, due to privacy issues, she said the school was not at fault. Olympic coach Ty Baumgardner, who did not return calls, did not include Gladden's name on the roster he released today with his game notes. Olympic (3-0) has a big non-conference game with Myers Park (3-1) tonight. Gladden scored nine points in Olympic's 88-79 win over Butler Tuesday. Gladden, a 6-foot-5 forward, is ranked among the state's top 10 players in the junior class by several statewide scouting services. He played at Queens Grant Charter School last year, which has no attendance boundaries. According to national recruiting website scout.com, Gladden has 11 Division I college recruiting offers. It's unclear where he might now try to enroll. Gladden was Olympic's fourth leading scorer (8.7 points per game) and second leading rebounder (5.0). He led the team in steals (1.7 per game).